Rebiya Kadeer. Photograph 2012 by Voice of America. In a sign of increasing official pressure on the sons of Uyghur leader Rebiya Kadeer and her other family members in East Turkestan, Chinese authorities have forced imprisoned son Alim Abdureyim to sign documents releasing ownership of two buildings, one formerly owned by Ms. Kadeer and the other by her daughter Akida Rouzi, to the state. Judicial officials reportedly told Alim, who was escorted to a court in Urumchi before being taken back to prison, that the buildings would be demolished in about two weeks' time. The move comes following the recent transfer of another imprisoned son of Ms. Kadeer, Ablikim Abdureyim, to a high-security prison. "In defiance of Chinese law and human decency, Chinese authorities stop at nothing to abuse my sons in prison," said Ms. Kadeer. "My sons' only 'crime' is their relationship to me- and because the Chinese government is no longer able to silence me, they are going after my family. We have seen that in other cases, such as with Chen Guangcheng, Chinese officials take a sick satisfaction in persecuting the family of those who have spoken out for truth and justice. The time has come for Chinese leaders to end the unlawful, brutal mistreatment of our loved ones." According to a family member, Chinese authorities stated that they plan to demolish the Kadeer Trade Center and the Akida Trade Center. The family member said judicial officials told Alim, who was sentenced to seven years in prison in November 2006, that he must sign the documents releasing ownership of the building, in exchange for very little compensation and a six-month reduction on his prison sentence. In August 2009, government authorities ordered Ms. Kadeer's children, grandchildren, and siblings to leave their homes in the Akida Trade Center. More than 30 members of the family had been living on the upper levels of the trade center. The Kadeer Trade Center and the Akida Trade Center, which previously provided a place of employment to thousands of Uyghur merchants, have long been viewed by Uyghurs throughout East Turkestan as a symbol of hope. The Kadeer Trade Center, established by Ms. Kadeer in 1990, served for many years as the main wholesale center in East Turkestan. Uyghur businessmen at both trade centers used much of their earnings for philanthropic purposes where no government programs existed. Though empty in recent years, the buildings themselves have remained emblematic of Ms. Kadeer's former business and philanthropic endeavors. The Uyghur American Association (UAA) is concerned that if the buildings are demolished, any public expression of discontent on the part of local Uyghurs, who are likely to be dismayed over the demolition, would be met with brutal force. According to a family member, Chinese officials are limiting both Alim and Ablikim to family visits once every two months. In general, according to China's Prison Law, prisoners' immediate family members are allowed to visit them once or twice a month. In addition, according to the family member, prison officials have restricted the amount of money relatives can bring to Alim and Ablikim on visits. This has resulted in them not having enough money to buy food, and the food they are given to eat is of very poor quality. Furthermore, they do not have enough money to see a doctor in prison, where payment is required. Chinese authorities have also confined the grandchildren and other family members of Ms. Kadeer to their homes and prevented them from being able to secure employment. Security forces visit and interrogate Ms. Kadeer's family members several times each week. The exact location of the place where Ms. Kadeer's grandchildren and other family members reside is unclear, but according to information from a family member, they are living in a residential building in Urumchi that houses the families of security forces who monitor their activities. It is unclear whether or not Chinese officials' recent actions against Alim are directly connected to official discontent over Ms. Kadeer's participation in the Fourth General Assembly of the World Uyghur Congress (WUC) in Tokyo, Japan. Chinese officials indicated their strong displeasure with the Chinese government over allowing the WUC to hold the meeting in Japan. Ms. Kadeer was reelected as president of the WUC at the mid-May forum. In early November 2006, prior to her first election as president of the WUC, Ms. Kadeer was warned through a third party that her detained sons would suffer greatly if she were to run for the position. Alim's seven-year prison sentence was handed down later that month, on the day that Ms. Kadeer was elected as president of the WUC, and another son, Kahar, was charged with tax evasion and fined USD 12,500. Recent developments continue a longstanding pattern of persecution of the family members of Ms. Kadeer, as well as state action against the family's business activities and properties. In response to the Uyghur human rights advocacy Ms. Kadeer has undertaken worldwide since her release from a Chinese prison in March 2005, Chinese authorities have retaliated with the imprisonment, torture, beating and harassment of her immediate and extended family. Soon after Ms. Kadeer arrived in exile in the U.S. in 2005, her son Alim Abdureyim was told to sign a statement confirming the Chinese government's allegations of tax fraud and embezzlement against his mother, and was told he would "sign it in prison after we've broken each one of your ribs" if he refused. Alim has been subjected to torture and other forms of ill-treatment while in prison, resulting in both physical and psychological trauma. Ablikim is also believed to have been tortured in prison. In addition to his prison sentence on charges of tax evasion in November 2006, Alim was fined 62,500 USD. Ablikim was sentenced to nine years in prison on charges of "secessionism" in April 2007. The trials of both men were plagued by a lack of evidence and conducted in the absence of due process of law. Both Alim and Ablikim were initially detained on June 1, 2006 and beaten severely by public security agents in front of their own children. 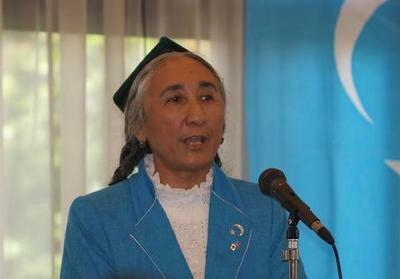 Ms. Kadeer was elected president of the Uyghur American Association (UAA) on May 29, 2006 by the organization's members at the UAA's bi-annual congress in Washington, D.C. In the wake of unrest that took place in the regional capital of Urumchi on July 5, 2009, Chinese authorities intensified their harassment against Ms. Kadeer's family, and engaged in an aggressive propaganda campaign to demonize Ms. Kadeer as the "mastermind" of the unrest. In August 2009, government authorities ordered more than 30 members of Ms. Kadeer's family, including, her children, grandchildren and siblings, to leave their homes in the Akida Trade Center. In interviews broadcast on state television in August 2009, sons Alim and Kahar, together with daughter Rushangul and younger brother Memet, were compelled to make false accusations about Ms. Kadeer's role in the unrest in Urumchi and condemn her for allegedly destroying the ethnic unity that had existed in the region. In addition, her children, their spouses and five of her young grandchildren were forced to sign a letter accusing Ms. Kadeer of having broken her promises not to participate in "ethnic splittism" when she left China. Since convening a top-level meeting on economic development in East Turkestan in 2010 known as the Xinjiang Work Forum, Chinese authorities have focused on the promotion of trade, industry and other fields in Urumchi and other cities. Official policies have facilitated growth in Urumchi's development zones and industrial parks, and have upgraded an annual municipal trade fair into an international trade expo aimed at making the city into a center of regional commercial hub. Alongside these moves, Chinese officials have carried out demolitions of poor, largely Uyghur areas in Urumchi, leaving many Uyghur merchants from the southern part of East Turkestan without a place to live and do business in the city. UAA calls upon the Chinese government to end its egregious persecution of the family members of Rebiya Kadeer and refrain from demolishing the Kadeer Trade Center and the Akida Trade Center. In so doing, Chinese officials would be taking a positive step toward ethnic reconciliation, and they would demonstrate their willingness to adhere to the rule of law. The continuance of the violation of family members' rights, on the other hand, demonstrates the will of a government to sacrifice the rule of law in favor of intimidation, cruelty and violence.